Chubb - Affluent Homeowner | Special Feature | TII - Travel Insurance | Webinars | Parting Shot | TRIVIA! 2017 has seen 8.3 million acres burned by wildfires.1 Although this isn't the worst record on file, "more large, uncontrolled wildfires were burning in 10 Western states in early September than at any comparable time since 2006. "1 Hundreds of homes have been compromised by these deadly flames, and thousands of residents have been forced to evacuate at a moment's notice. The threat of wildfire is very real but Chubb Personal Risk Services can help protect your clients' homes with its complimentary Wildfire Defense Program2. Chubb has partnered with Wildfire Defense Systems, Inc. (WDS), a leading wildfire management organization, to bring customers valuable protection before, during, and after a wildfire. 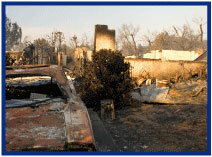 WDS is supervised by wildfire professionals with up to 35 years of experience. Customers can enroll easily by completing the applicable authorization form here. Upon request, Chubb's WDS team will conduct a complimentary, onsite wildfire hazard assessment to recommend ways to improve the chance of surviving a wildfire. 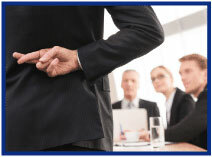 Take action today and encourage your clients to protect themselves! Contact Nancy Doherty at Big "I" Markets for a list of your clients that are eligible for this complimentary service. For additional information about this program, click here. Chubb Wildfire Defense Services is not available in all jurisdictions and is not available to condominium, cooperative or renter policyholders and policyholders covered by California Fair Plan Extension policies. Chubb Wildfire Defense Services is also not available to Differences in Conditions (DIC) Platinum Portfolio policyholders. Talk is cheap, they say. This is especially true in the business world. For example, have you ever purchased an item from a store that claims "We stand behind our products!" only to discover they have all kinds of arcane refund rules when you try to return the thing because it broke? Business leaders have an image in mind for their organizations. A freight-transport company has to project operational efficiency to its current and potential customers, while a tech company should be seen as having a culture of innovation. However, you can't claim operational efficiency if, behind the scenes, no one in the organization has patience for building systems or following procedures. And you can't boast about leading-edge tech products if you lack the creative resources and know-how to develop them. Well, one can do those things, but customers will quickly learn otherwise and move on to a competitor. The problem is: How do you know if your company has the people in place to fulfill the image you want to project? Performance competencies are a great place to start. Learn more about your exclusive Big "I" member discount on Caliper's offerings at www.iiaba.net/Caliper. Here is a collection of travel tips that you can pass along to your clients planning an out-of-town or international vacation. Wherever you are, wherever you are going, bring snacks. Virtually every single trip site with more than five tips will tell you this, so it must be universal advice. Read reviews. When planning your trip, refer to user-reviewed sites such as TripAdvisor.com. Also check Yelp.com and OpenTable.com for reviews of local restaurants and businesses. Look at how recent the review is and as a rule of thumb, the more people that have contributed, the more valuable overall ratings become. Another source is local bloggers that focus on their city or region. If your family is large enough it might be advantageous to rent an apartment or house instead of staying in a hotel. Since most will include a kitchen, you can save money by buying groceries. Pack your electronics in a single layer. If things are scattered or jumbled, the TSA screener may spend more time determining what they are [from the X-ray] and have to manually check your bags. Create a small first aid kit including bandages, OTC pain killers, decongestant, antibiotic cream, etc. Keep prescription medications separate. If you check baggage take a picture of it and a close-up of the baggage tag so it will be easier to locate if it gets lost. Call your credit card company before you leave and put a travel alert on your card. While you're at it, jot down their international customer service number. Know the destination country's money situation. The minute you arrive at your destination, you'll need to start paying for things (taxi, food, tips, etc.) so make sure everyone knows beforehand what kind of currency they'll need, and the exchange rate so they won't be shocked later. Also, it can be helpful to know the tipping expectations. Americans tip in many situations, but in some other countries tips are not normally expected or given. Lastly, be sure to have cash (changed into local currency) because in many countries credit cards are not accepted as frequently as they are in the United States. Before traveling, stay up-to-date with current travel situations from the Department of State by signing up for automatic alerts and message updates through the STEP program. 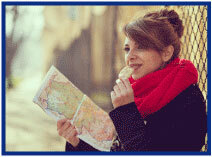 Travel insurance is worth purchasing for big-ticket trips that are largely non-refundable. The typical plan will cover emergency medical expenses and baggage loss and delay, and recover at least some of the cost of your trip if your vacation had to be canceled or cut short. As a Big "I" Markets agent you can offer your clients travel insurance through our partner carrier Travel Insured International. By investing in a plan with Cancel for Any Reason Coverage, clients may cancel their plans and get up to 75% of their total trip cost for any reason they choose, including a travel alert. They just have to decide 48 or more hours prior to scheduled departure in order to be eligible. The TII travel blog covers a myriad of travel related subjects, including travel agent myths, sleeping on flights, using a cellphone abroad, navigating hurricane season, and picking the right hotel, just to name a few. Review the product guide with your client®. Use the Quick Quote Feature on the Travel Insured International Site to calculate premium and add optional coverage if desired. When you are ready for coverage to be issued, you MUST click on Request a Quote to access the applications and enter client information. Then scan and attach the completed application as a "New Message" or email to kyle.yoder@iiaba.net. A credit card number is required to issue coverage. Big "I" Markets Can Help! What's the difference between and IAR and an RIA? 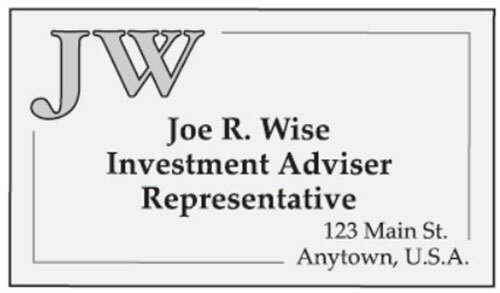 One is an individual, the Investment Advisor Representative and the other is an entity, the Registered Investment Advisor. Both engage in providing investment advice for compensation and both must be registered with the proper regulator. Investment Advisor Representatives always are registered in their state. Registered Investment Advisor entities register with their state or when larger--for example, when their assets under management exceed $110 million-- registration is required with the Securities and Exchange Commission or SEC as a "federal covered advisor." As shown below, when put down in writing one should not generally refer to being an "RIA," "R.I.A.,""IAR," or "I.A.R." For me, it makes sense to avoid as it creates confusion between the two and the SEC has taken the position it could be misleading as it could convey a level of education, competence or special training that it should not. Source: Kaplan University, Securities Licensing Exam Manual, Series 65, 10th Edition. If any of you missed the Student of the Industry feature for the past month or two and were wondering where it was… it's back! I was temporarily distracted from sharing my industry findings gained while working for you at Big I Advantage, Inc. We had our annual membership meetings for IIABA, our fiscal year end and I was studying for my own Investment Advisor Representative status to bring added redundancy to our licensing for Big "I" Advisory Resources, LLC, our Registered Investment Advisor and advisor to the Big "I" 401(k) MEP. As we go now you may notice a bit more on securities and investment issues related to our fair industry in addition to property & casualty and life & health. Speaking of retirement… you can learn more about our member-exclusive Big "I" Retirement offerings at iiaba.net/Retirement, including the Big "I" MEP 401(k) Plan and Big "I" IRA program. Congratulations to our agent in Oklahoma on an Affluent Program - New Business sale of $17,561 in premium!